Liz and I have finally had our reproduction of this painting framed and hung on the wall. It invites the meditative mind. The clamoring world -- restless to rid itself of Christ, His revelation, and his Church -- coming "with lanterns, torches, and weapons" to arrest Him. The World is trying the experiment of attempting to form a civilized but non-Christian mentality. The experiment will fail; but we must be very patient in awaiting its collapse; meanwhile redeeming the time: so that the Faith may be preserved alive through the dark ages before us; to renew and rebuild civilization, and save the World from suicide. Caravaggio has painted more than just an episode in the Passion; he has captured something about the human drama as such. Inasmuch as Christ in Caravaggio's painting is being "handed over," the hands in the painting tell the story. The left (and symbolically sinister) hand of Judas, manhandling Christ as he betrays him with a kiss. On the upper left, the panic-stricken hands of a fleeing disciple. All of this frantic activity finds it counterpoise in the hands of Christ, folded as though in prayer. But then there is one more prominent hand in the painting. 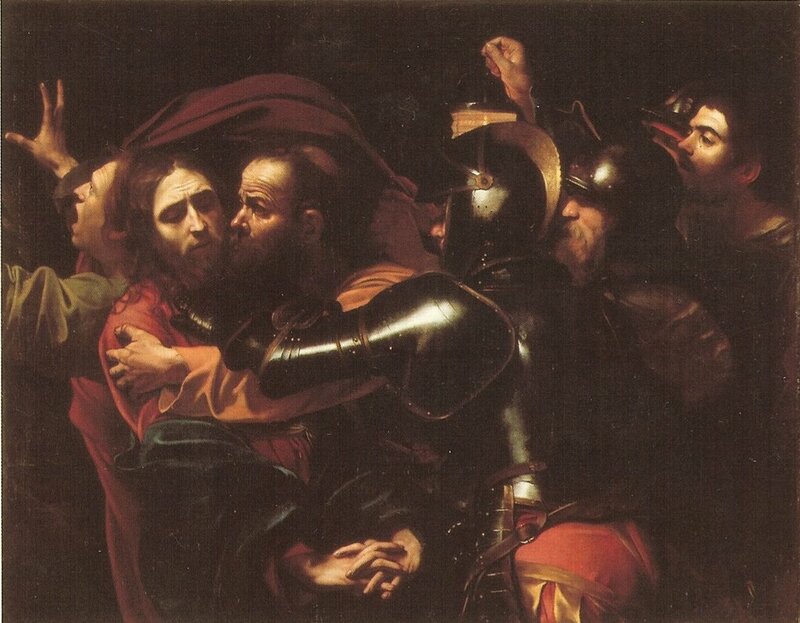 As he has done in other paintings, Caravaggio has placed himself in the upper right of the painting. There the artist holds a lantern, and the hand that holds it is poised like the hand of a painter at work. This seems to me to be the artist's recognition, not only of his own particular vocation, but of the essential vocation of the Christian faithful: to tell the story.